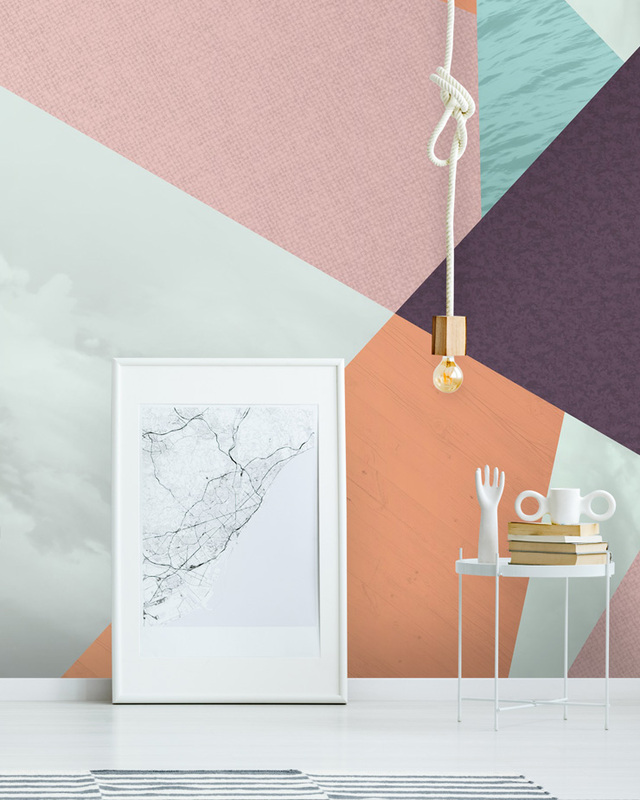 Pantone’s Colour of the Year for 2019 has been announced, and we’re so excited to share our wallpaper ideas with you. The colour to covet is Living Coral (Pantone 16-1546), a humble hue drawn from the natural pigmentations found in nature. It’s the colour of a coral reef. Or the colour of a sunset. It’s the colour of peonies or orchids in the summer. The clue’s really in the name, as it symbolises all things living, whilst having the ability to bring your interiors to life too. You’d be fooled to think this sultry shade was only suitable for springtime. Because it actually works wonderfully well all year round, and features in some of the most on-trend wallpaper patterns and designs of the moment. Think muted auburn tones and washed-out terracotta, warm pinks and rosy browns. Think Tom Ford’s iconic coral lipstick. Think Moschino’s AW18 runway. Or G-Plan’s retro three-piece suites in russet orange. 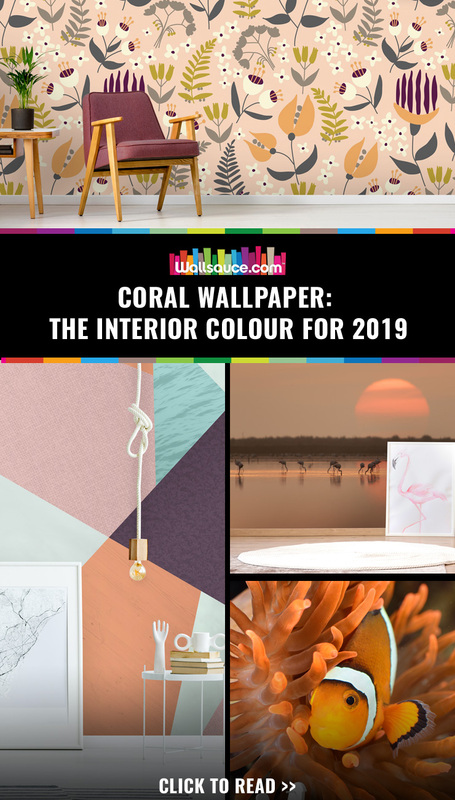 If you need some inspiration to prep your home for 2019, here are some of our favourite coral wallpaper designs to fall in love with next year. True to the Living Coral Pantone trend, whilst incorporating other muted hues for a retro look. This geometric pattern wallpaper is designed to steal the show in an empty living space. If you’re looking to add some coral charm to a big open plan area, this beautiful wall mural is ideal. Bold geometrics also work well in an office or an art studio, somewhere that cries out for something visual to inspire creativity. Complement the room with some industrial furniture, and opt for metals like black iron and galvanised steel to add more depth and dimension. White tables and chairs will keep a small room light and airy, whilst black can give your space a sophisticated finish. And don’t forget lighting design – colours like these need good light quality in order to shine. This terracotta tile wallpaper is another geometric work of art from our current collection. Focusing in on sharp angles and shapes, this is the perfect mural for a feature wall. The palette is well-coordinated and gorgeously neutral, making it an easy design to style with furniture you already have in the home. Three distinct shades of russet orange, reddish coral, and beige coral star in the show, alongside supporting hues of soft black and chic grey. A mid-century three piece suite is a match made in heaven. Or for something more opulent, go for an Edwardian style sofa…..the kind with buttoned fabric and plush velvet cushions. To bring out that colour palette in the background, choose gold accents for lamps, lighting and décor. Cute and kitsch is back in, and we’re loving this organic interweaving wallpaper with its coral backdrop and peachy coral flowers. 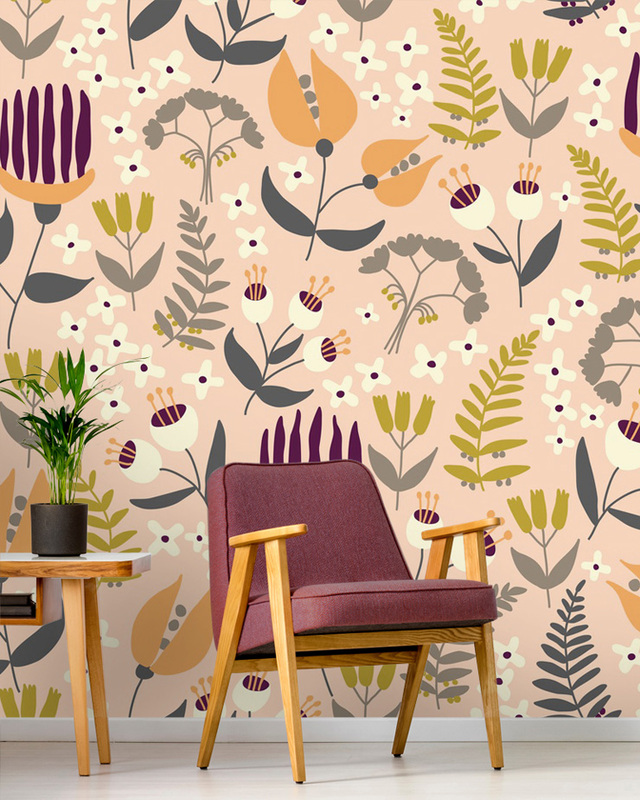 It’s a stylish botanical mural for any room in the house, from boring downstairs toilets that need a new lease of life to feminine bedrooms and modern dining rooms. There’s a springtime feel to this wallpaper design, but come winter you can cosy up the room by playing around with textures. Use faux fur and dark velvet cushions to decorate your sofas and chairs. Add interest to the floor with luxurious rugs, and opt for dark wood finishes to generate a feeling of warmth. If you really want to experience the Living Coral trend in your living room, choose a sunrise or sunset wallpaper design with warm coral tones. It’s a great way to transform a living, reading or sleeping space. Imagine waking up to such a spectacular view every morning! 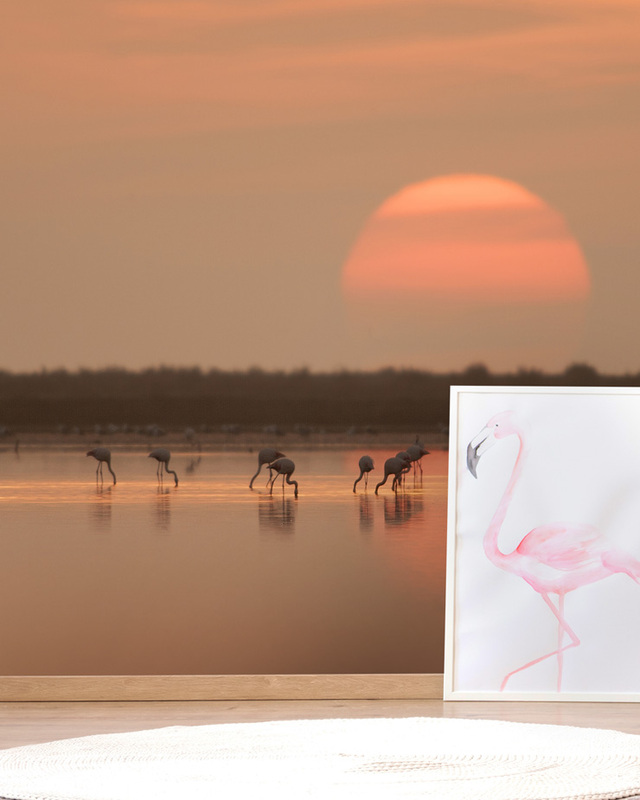 Our flamingos at sunrise wallpaper offers a soothing escape whilst remaining on trend. But like many of our photography wall murals, it’s timeless and will never go out of style. Keep the room minimal and free from junk to let the sunrise photo take centre stage. Having ample storage will be key here. Another huge trend that we have to talk about is marble. Get ready for a marble explosion in 2019. We’re talking marble floors and surfaces, marble table tops and marble furniture, marble artwork, marble décor, and of course marble wallpaper. 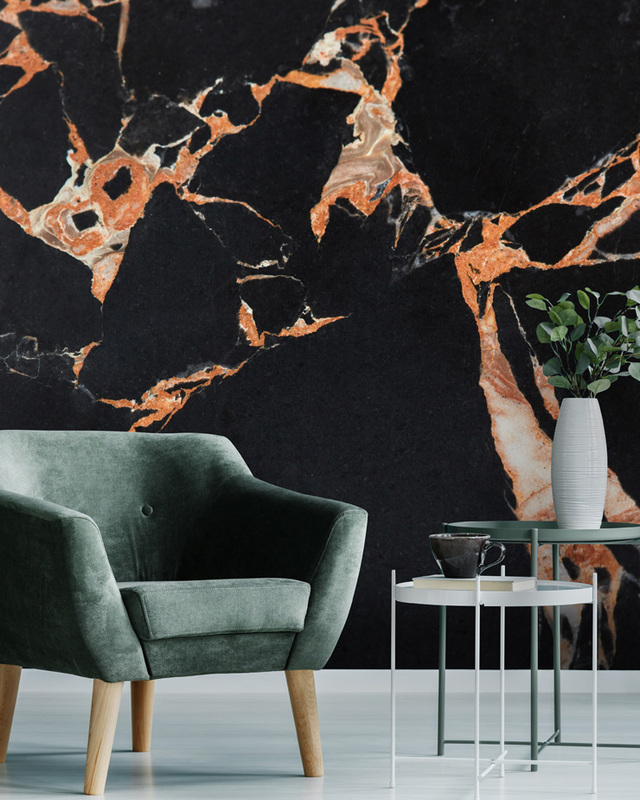 Our unique dark marble and brown wallpaper brings together the sophistication of black and the peeping terracotta tones streaking through the murky mass. 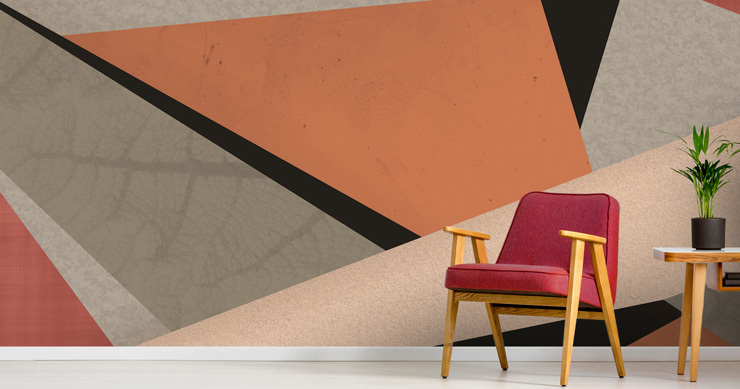 It’s the perfect mural to replace a large void and coordinates well with retro interior styles. Gold and rose gold features will make the coral in the wallpaper pop, and textures such as shaggy throws, faux fur and huge chunky knits will keep the landscape interesting. If you love ocean photography, this stunning wallpaper will make a fantastic focal point for a bedroom, study or living space. 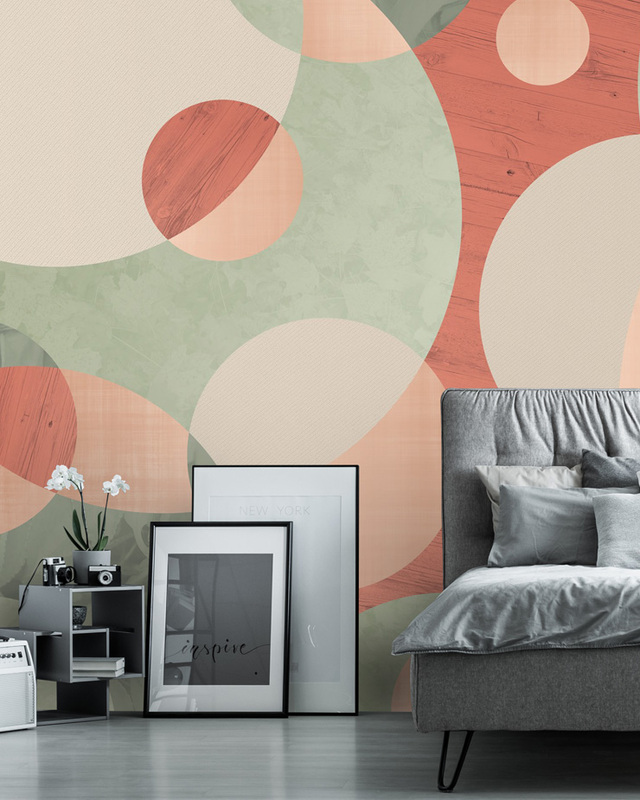 An ode to the Living Coral narrative in more ways than one, this clownfish wallpaper mural is both true to its colour and true to its origin. A coral reef forms a beautiful backdrop, bursting with orange, peach and vivid coral. This mural is beautifully bright and can help to add light into your room, whilst opening up the space by transporting you to an underwater world. 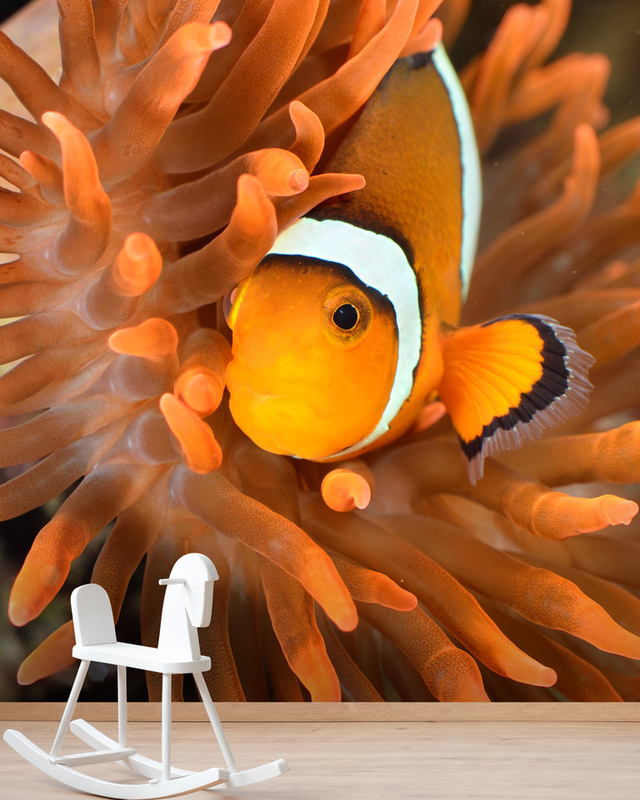 Fish and sealife wallpaper is a fantastic idea for kids’ rooms, playrooms, studies, and much more. They appeal to all ages and are such a celebration of nature. According to Pantone, Living Coral is an “animating and life-affirming coral hue with a golden undertone that energizes and enlivens with a softer edge”. This muted natural wallpaper does exactly that. Bringing a warm hue to any room with a contemporary effect, and adding energy to an otherwise flat interior plane. If you want to add depth and dimension to a large empty space, play around with shapes. Discover different silhouettes and contours, and look at how they interact with one another in various colour combinations. It’s rather hypnotic, wouldn’t you agree? They’ll be an excellent talking point in any chic suburban house or city centre apartment. Next year’s hottest murals include geometric prints, 3D prints, check and circular patterns – and corals are going to feature heavily in all of these. How will you be embracing the new interior trends? Please leave your comments in the box below. 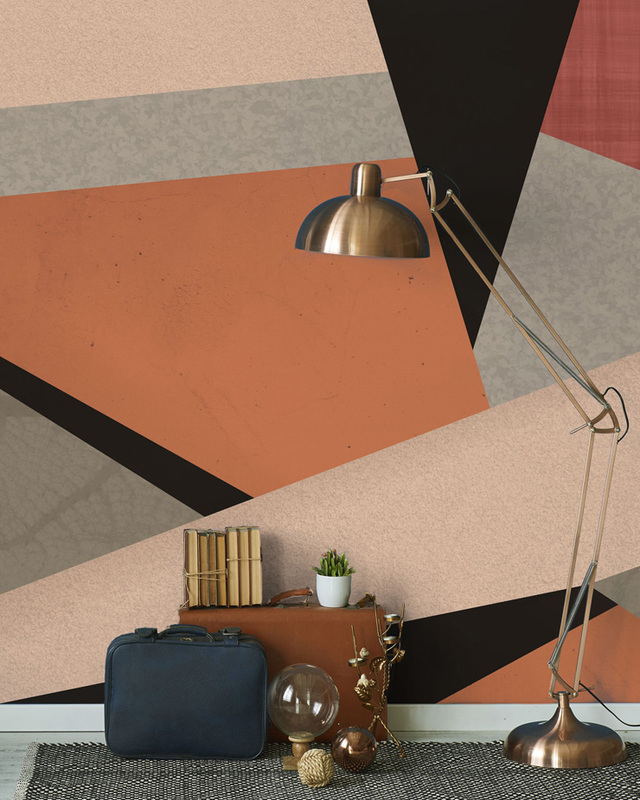 Fabulous post - I love these coral wallpapers, especially the geometric ones!